Five locations across England will receive a share of £20 million to invest in local culture, heritage and creative industries and help drive economic growth, Culture Secretary Jeremy Wright announced today. "Creativity, arts and heritage make our towns and cities unique and our communities better places to live. 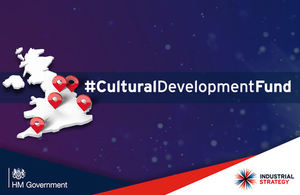 "The Cultural Development Fund will support tailored local plans that use culture to create jobs, boost tourism and ultimately regenerate communities. "I welcome today’s announcement, which marks another important step in the implementation of the Sector Deal agreed between the Creative Industries Council and Government. These awards highlight the extent to which the creative industries are now a key part of local economies all over England and should enable them to grow further."